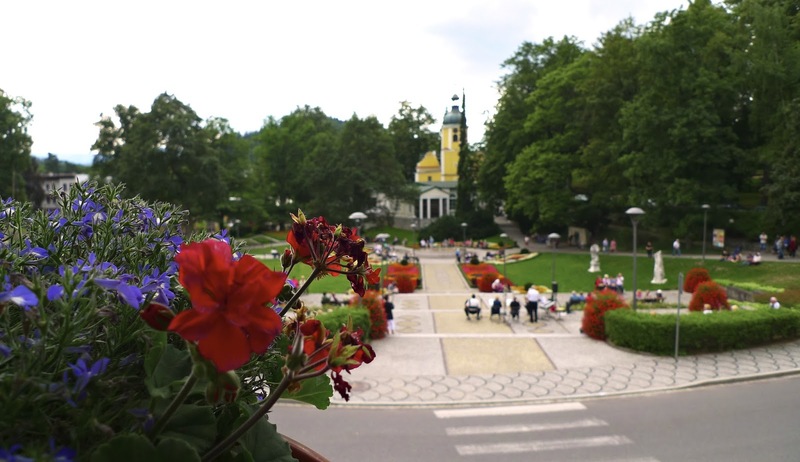 The pianists are not without significant musical competition in the Spa Park! A modicum of history first. 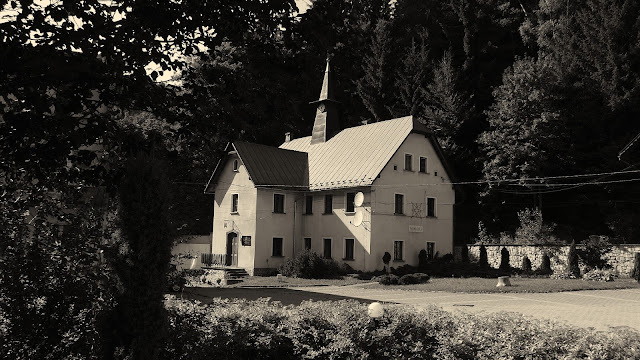 Part of the way through his studies Joseph Elsner recommended that Chopin ‘take the waters’ or 'go into rehab' not far from where Elsner was born in the small Silesian spa of Bad Reinerz (now Duszniki Zdrój). 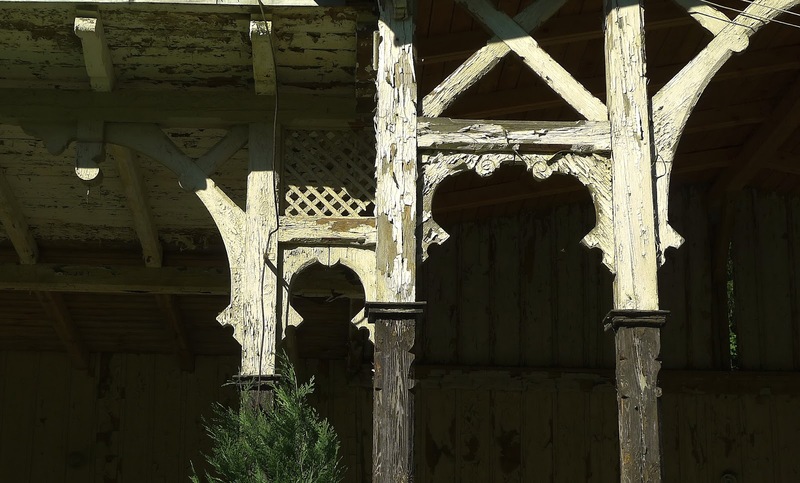 Originally on the Prussian-Bohemian frontier, the village is now in the south-west of Poland on the border with the Czech Republic. Frycek’s studies and intense partying into the small hours during his third and final year at the Liceum had begun to affect his health. He was a bit of a 'party animal' was Frycek! In his youth not the melancholic consumptive of popular myth at all. The virtuosic youthful exuberance of the concertos, rondos and variations reflect this freedom from care. This year the Artistic Director of the festival Piotr Paleczny has assembled a particularly marvellous collection of pianists in this great celebration of pianism, one of the most demanding venues for any solo performer in the world. 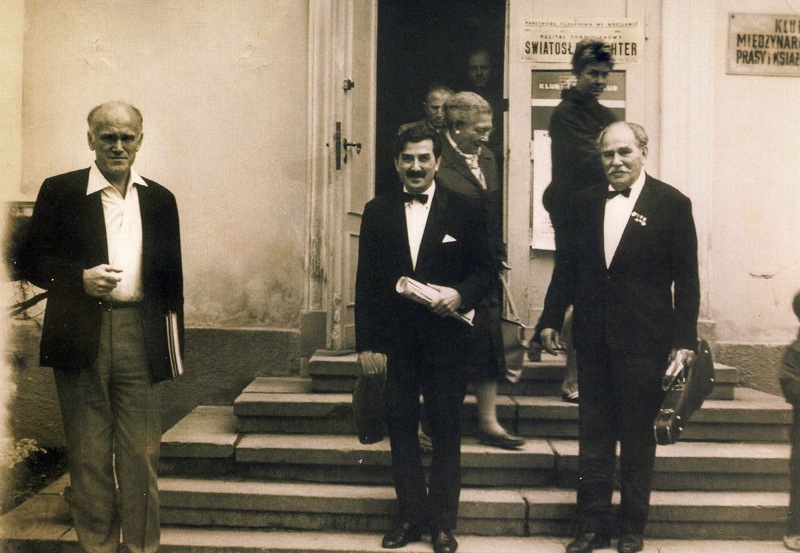 A tough one is Duszniki… His tireless work as a jury member in many major international piano competitions and faultless judgement of musical talent gives him unique access to mature artists and prize winners who often play at Duszniki shortly after winning their grueling ‘tournament’. You hear them first at Duszniki! Given the prestige and focus of this remarkable event, the reduction of Professor Paleczny’s cultural budget by the powers that be, a war of attrition it seems, is nothing short of scandalous. I like football too…but surely sport should be only a part of one’s human development, not the be all and end all as it seems to be becoming. The sublime poet of the instrument from the Italian part of Switzerland, Francesco Piemontesi, is to my mind an artist of the highest calibre of refinement moving towards the heights occupied by Michelangeli. In 2011 he reduced the entire audience here to awed silence with his profound understanding of Schubert. One could hear a pin drop in that rare musical moment of spiritual transcendence. Last year he was ill and forced to cancel his Duszniki engagement so I greatly anticipate this recital. The recital by Beatrice Rana, another wonderful female Italian pianist from a family of pianists (we have heard so many ‘belissimas’ at Duszniki in recent years) is sure to be a treat. Her performance as one of the finalists of the 14th Van Cliburn Competition 2013 was nothing short of magnificent and gave her second place. 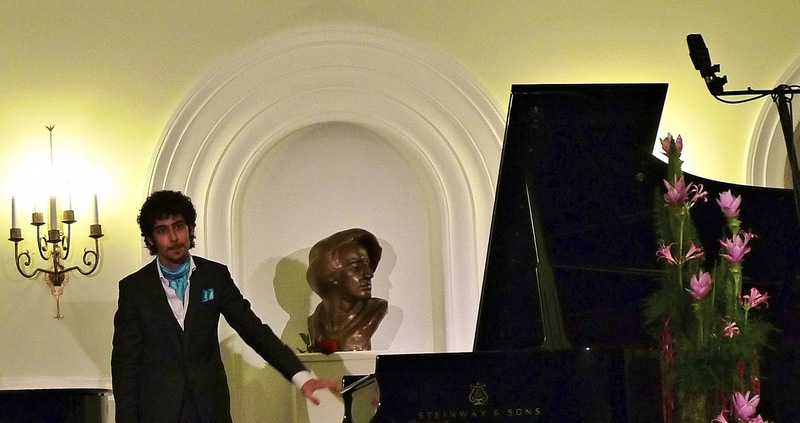 The winner of this prestigious competition, the Ukrainian pianist Vadym Kholodenko, will give the final recital that closes the Duszniki Festival this year. What is it about Ukraine and its ‘spirit of place’ that produces this plethora of pianists of the greatest musical brilliance? Olga Kern is now recognized as one of her generation’s great pianists, a career launched a decade ago with her winning gold-medal performance at the Eleventh Van Cliburn International Piano Competition in 2001. She was born into a family of musicians with direct links to Tchaikovsky and Rachmaninoff. She has a truly vivid stage presence, passionate musicianship and extraordinary technique appearing regularly in the greatest halls. I hope she has chosen some Rachmaninoff in her programme. Professor Paleczny has an ear for precocious young musical talent and we are often given the chance to experience this at Duszniki. The sixteen year-old Carmen Knoll from the US is one such precocious talent having won some 25 important national competitions already (!) and now studying in the pre-college division at the Julliard in New York. She is under the instruction of Professor Choong-Mo Kang who is also taking the first group of Masterclasses which accompany the recitals at Duszniki. This wonderful musician and pedagogue from South Korea took classes here in 2010 and before that I heard his superb account of Bach’s Goldberg Variations. We will also hear during the same recital as Carmen, the Singaporean Shaun Choo, who is also building a fine reputation as a young and tremendously gifted talent. 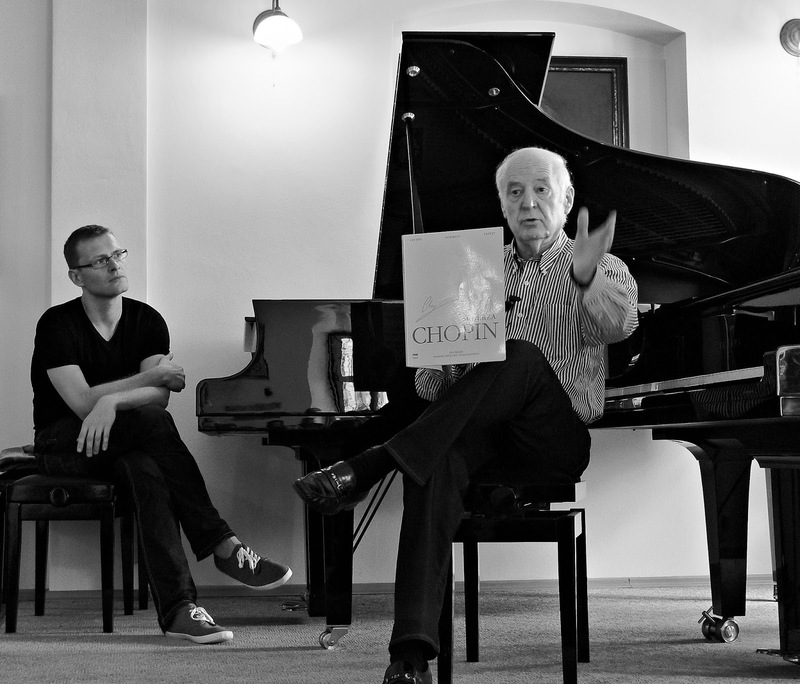 The other professor taking Masterclasses is Professor Arie Vardi an Israeli pianist and teacher. He is currently teaching at the Buhmann-Mehta Academy of Music in Tel Aviv, the Hochschule für Musik und Theater in Hanover and at the Bowdoin International Music Festival in Brunswick, Maine. Many of his students have won prizes including Yundi Li who was awarded First Prize at the 14th International Frederick Chopin Piano Competition in Warsaw in 2000. His recordings of Debussy and Ravel have won prizes and critical acclaim. I will be very interested to discuss his studies with Karlheinz Stockhausen who has remained a formative influence on my own musical appreciation after attending his classes in Cologne in the late 1960s (as an author of 'indeterminate texts' not a musician) unlikely as that may seem to you! I have not had the opportunity to hear the fascinating Russian born Jewish pianist Kiril Gerstein. His early training and experience in jazz has contributed an important element to his interpretive style, inspiring an energetic and expressive musical personality that distinguishes his playing. 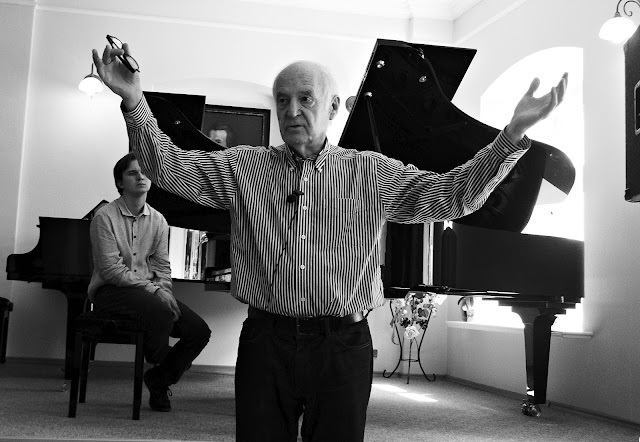 In 2010 Kiril Gerstein became the sixth recipient the prestigious Gilmore Artist Award ($300,000) presented every four years to an exceptional pianist who, regardless of age or nationality, possesses broad and profound musicianship and charisma and who desires and can sustain a career as a major international concert artist. 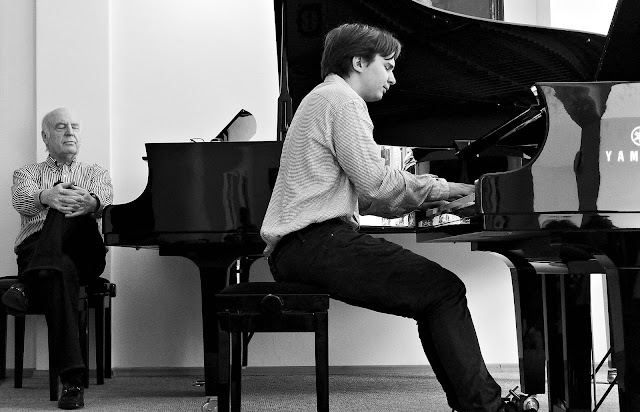 Of the young brilliant Russian pianist Vitaly Pisarenko, the New York Times wrote "...Immensely gifted pianist...with prodigious technique, myriad shadings and scrupulous accuracy..." On 12 April 2008, he won First Prize at the 8th International Franz Liszt Piano Competition in Utrecht, the Netherlands and from there his rise has been that of a comet. I briefly heard the Italian pianist Federico Colli on the radio during the 2012 Leeds Piano Competition which he won. I look forward to forming a more considered opinion. Held every three years, previous winners include Andras Schiff, Radu Lupu and Artur Pizarro. Colli, a native of Brescia (where incidentally Michelangeli was also born) is instantly recognizable by his curly hair and his luxuriant cravats. He previously won the 2011 Salzburg International Mozart Competition. In an interview on BBC Radio 3 the pianist Kathryn Stott called him ‘totally amazing’ and a pianist who ‘completely reinvented The Emperor. It was fresh. 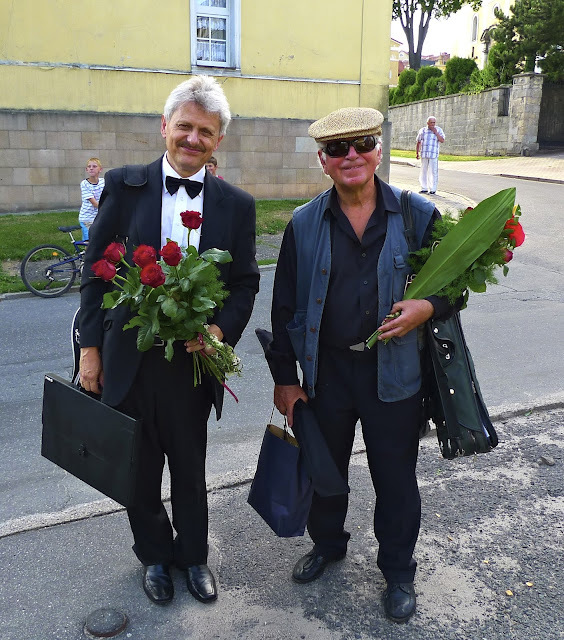 He's a superb pianist.’ There is always a ‘specialty’ at Duszniki and we are to treated to a violin-organ recital by Krzysztof Jakowicz violin and Krzysztof Marosek organ. I presume it will take place in the Duszniki parish church with its astounding baroque ‘whale pulpit’ although the church is being restored I believe. We will also be able to hear one of the extraordinary gifted musical brothers from South Korea, Dong Min Lim (his brother is Dong Hyek Lim) who I remember with great affection from the 2005 International Fryderyk Chopin Competition in Warsaw when they won joint Third Prize. How amazing was that! Wonderful pianists both with a completely different approach to the music and instrument. That year the competition was won by the superb Rafał Blechacz (who performed at Duszniki to great acclaim shortly after). I am also greatly looking forward to again hearing Ilya Rashkovskiy who was born in Irkutsk in Siberia and has now won First Prize in the 2012 Hamamatsu Competition in Japan. Irkutsk seems hardly conducive to piano playing or exposure to classical music I would have thought but perhaps the cold keeps one inside practising to stay warm or I am not sufficiently imaginative or informed! The years pass and the mystery of the relative lack of young truly world class Polish pianists deepens. Duszniki and its lack of powerful Polish pianists has always been a puzzle to me – great performances and pedagogical talents yes, but unique and commanding musical voices on the wider international stage? Where are the unique voices of the Paderewskis, Rubinsteins, Małcużyńskis, Hofmanns, Friedmans, Godowskys, Leschetizkys, Turczyńskis, Koczalskis, Kons and Michałowskis of the immortal past many of them living contemporaneously? Consider how they dominated piano-playing and the world of piano pedagogy before and in some cases after World War II. Yes we have witnessed the international renown of Krystian Zimerman, Piotr Paleczny, Emanuel Ax, Janusz Olejniczak, Piotr Anderszewski, the Canadian-Pole Jan Lisiecki and the wonderful Rafał Blechacz but even then to my mind only one or possibly two of this group is ‘up there’ among the past pianistic pinnacles. Whatever has happened? Answers on a postcard please. Zbigniew Raubo, the only Pole giving a solo recital apart from young laureates is a fine pianist co-organizer and deputy president of the Katowice-based Silesian Music Society and chairman of the Katowice Music Academy branch of the Karol Szymanowski Music Society in Zakopane. Despite his young age, Zbigniew Raubo has some notable achievements as a teacher to his credit. His students have won numerous prizes at national and international piano competitions. 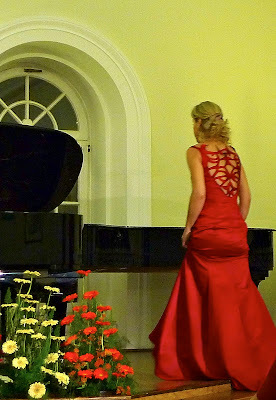 The Ukrainian pianist Mariya Kim studied under the Artistic Director of the Duszniki Festival Piotr Paleczny graduating from his class in 2011. Mariya Kim has been named a prize-winner at 18 International Piano Competitions including 1st Prize at the International Piano Competition ‘In Memory of V.Horowitz’ and 1st Prize at the VI Paderewski International Piano Competition. Finally I am very much looking forward to the Russian Boris Giltburg who has just won First Prize in the prestigious Queen Elizabeth Piano Competition in Bruxelles. In August 2012 Giltburg released the Prokofiev “War” sonatas on the Orchid label, appearing in Gramophone as ‘Editor’s Choice’ and receiving 5 stars in the Daily Telegraph: “These performances of Prokofiev’s three ‘War’ Sonatas eclipse all others on record - even those tirelessly and justifiably celebrated performances by Richter and Gilels” (Gramophone, Oct 2012, Editor’s Choice). He made his BBC Proms debut in 2010 with the BBC Scottish Symphony. Last season he made his London Philharmonic debut, and is a popular guest with many UK orchestras. And so I am stocking up on vitamin supplements, cycling, visiting the gym and otherwise ‘fitting up’ for this marathon of pleasure. Oh what a different world of young pianists this is from the social milieu my great-uncle Edward Cahill inhabited as a concert pianist in the 1920s and 1930s, the world of aristocratic Paris, London and the French Riviera. A scarcely recognizable musical planet existed then as I approach the conclusion of writing his glamorous and colourful biography. Motorway construction proceeds apace in Poland with the assistance the EU which has reduced my driving time and the convenience of it from Warsaw to around 6.5 hours (excluding a leisurely picnic lunch in a forest). An uneventful journey. Poland too is suffering a business recession which has led to the closure of the Hotel Jarzebina at Duszniki where I have stayed during this festival for the last seven years. As it had by far the best location, chef, food and wine in the town the situation is really quite depressing. I am now staying at a place called Muza which is closer to the Dworek Chopina. It is a rather basic place but with 'the particular atmosphere' of a distant Art Nouveau past that one might treat with affection in time. My room is spacious, high-ceilinged and just above the tumbling stream and more blessedly cool in the heatwave we seem to be having here. In reality however I am missing my usual hedonistic comforts of Jarzebina beside the rushing stream with mountain walks close by. '....There is, however, one element of this year's Festival programme that makes it truly unique. During the final four evenings we will have an opportunity to listen to the winners of the four largest and most prestigious piano competitions held over the last few months - the real Olympic Games in the field of piano performance! I am referring to the Leeds and Hamamatsu competitions, the Queen Elizabeth Competition in Brussels and the Van Cliburn International Piano Competition in Forth Worth, USA. There are, indeed, few other places in the world (if there are any at all! ), where in the course of several days one is able to listen to the performance and become familiar with the artistic level of truly 'the best of the best' of the young generation of pianists. 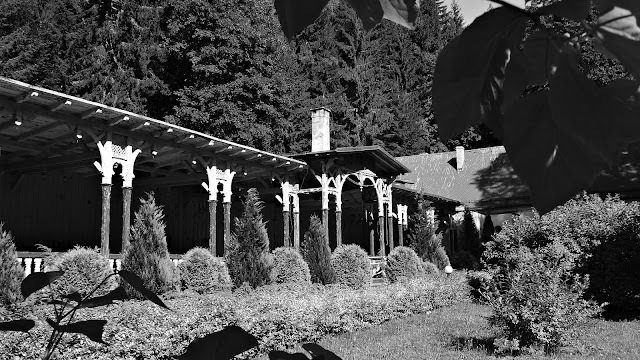 Such a unique opportunity will be available to you at this year's 68th International Chopin Piano Festival in Duszniki Zdroj, Poland. Beautiful warm (even hot) and sunny weather and I am looking forward to the opening of the festival by the Latvian/Israeli pianist Dina Yoffe this evening. She is playing among other works all the Chopin Impromptus, three late Brahms Intermezzi and the rarely performed Beethoven 'Eroica' Variations. The last time I heard this work live was at the Royal Festival Hall in London many years ago performed by Emil Gilels - a tempestuous and turbulent performance indeed that remains unforgettable - a great mountain standing before one. She began her recital with the lyrical and undemanding Nocturne in F-sharp major Op. 15 No.2. This nocturne so beautifully balances the singing cantabile line of Chopin, 'the Bellini of the piano', with his more strictly pianistic writing. Such a beautiful melody lovingly sung at the keyboard. Listening to the four Chopin Impromptus as a group illustrates the extraordinary development in this composer's writing and the spiritual inward looking process that took place over so few years. She began with the A-flat major Op. 29 (1837) although Chopin's first was the C sharp-minor - Fantaisie-Impromptu Op. posth. 66 of 1834. The Impromptu genre was not that well established, even for Schubert, when Chopin composed his first but as the years passed he gave the form his own particular identity. These two works are rather similar in design and motivic structure and Yoffe revealed some superb counterpoint in the Fantaisie Impromptu that had remained previously invisible to me. The Op. 29 I felt was taken too fast to be meaningful and was trivialized rather. However her performance of the F-sharp major Op. 36 (1839) indicated the truly surprising and almost inexplicable stylistic gulf that Chopin had crossed during those two intervening years. Perhaps there is something awry in my judgement of performances of the much performed Andante spianato et Grande Polonaise brillante in E-flat major Op.22 (1830-1835). To my mind on so many occasions, pianists of renown and established virtuosi have failed to come to full terms with this deceptive work, too often underestimated in difficulty. The piece is so difficult to get just right and excite the audience to adulation which it was clearly designed to do! It is a bravura concert work in the styl brillant originally written for piano and orchestra begun during his last years in Warsaw. The piano part is often performed on its own coupled with an Andante introduction. In many ways it is the apotheosis of Chopin's writing in this spectacularly virtuosic early style reminiscent even of Liszt. He wrote the introductory Andante spianato ('smooth') for one of Habeneck's concerts de conservatoire in Paris in 1835 where he performed both. Chopin often performed the Andante on its own in more intimate company. I felt Yoffe performed the work well of course but the Polonaise lacked that incandescent display of diamond-like sparkle, dangerous tempo and perfect accuracy so vital to its nature. I remember the Austrian Ingolf Wunder and so many others struggling with this work to 'bring it off' perfectly. An early recording by the brilliant Polish pianist Wojciech Switala for Katowice Radio dominates every other performance I have ever heard. Breathtaking perfection. After the interval we heard a fine performance the Beethoven 15 Variations in E-flat major (with fugue) Op. 35 'Eroica' (1802). This work shows Beethoven at his most robust. He loved this theme and of course used it in the Finale of the Symphony No. 3 'Eroica' composed the following year. Beethoven also seemed to feel an inner compulsion to embrace the variation form as was obvious in the sublime destiny of the simple Arietta theme in the op. 111 Sonata. I felt her approach rather over-pedalled for my taste (as was much of this recital). I found her tone and touch surprisingly harsh on occasion and lacking in true subtlety. Her Beethoven and Brahms were approached in much the same pianistic style which for me was troublesome with my love of a more detached 'classical' articulation and period stylistic approach in Beethoven which naturally comes directly from my experience playing early instruments of Beethoven's period. This being said I think the modern piano in many ways realizes the massive and dramatic sound dynamic Beethoven had in his imagination but lacks the variation in colour, timbre and texture one can obtain on earlier pianos which was vital to him as well as the different function of the pedals on the early instrument. Wit and lyricism were present but overall the interpretation did not achieve the classical monumental structure this work achieves in the closing fugue. I will be interested to see how she approaches playing an early instrument in the Chopin i jego Europa festival later in the month. Yoffe concluded her recital with three of Brahm's Intermezzos (Fantasien) from Op.116 of 1892. She performed No.1 the Capriccio in D minor with all the curiously inwardly dramatic thought the piece seems to require. The No. 6 Intermezzo in E major is a piece I have heard rarely in concert. It is such a beautiful piece full of romantic yearning. The No. 7 is the Capriccio in D minor - ah, how the ardent, passionate soul of Brahms speaks even engulfs one in this work. It hardly surprising that Arthur Rubinstein was so overwhelmed by such music as a young man. Overall then a recital that for me at least did not reach the anticipated heights given her distinguished reputation. As is so often the case with much anticipated concerts, the encore and the quality of the interpretation almost eclipsed the rest of the recital. Yoffe chose one of the great culminating works of Chopin's final years and 'late style', the Scherzo No. 4 in E major Op. 54 (1842-3). This is a very remarkable, unaccountably underrated and quite long composition that is tremendously forward-looking, almost 'impressionistic' in a twentieth century way. The greatly brightened audience response to this fine and idiomatic interpretation lying deeply within le climat de Chopin indicated the slight disappointment I too had felt with the official programme. The very attractive Polish pianist Tamara Granat gave a running commentary on all the pieces the duo performed and spoke interestingly about the technical problems at the keyboard facing duo pianists – crossing hands and so on. Quite enlightening. 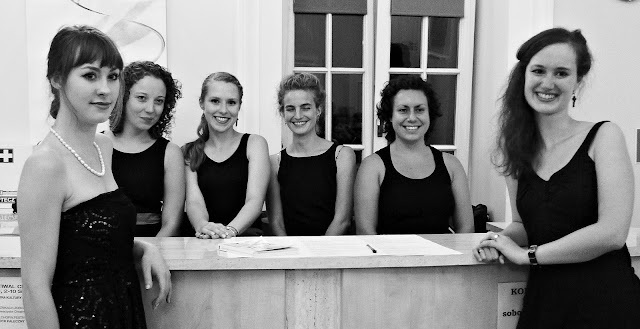 They began with the lively and spirited Norwegian Dance in D minor Allegro marcato Op. 35 No.1 for four Hands (1880) by Grieg. How easy it is in a mood of serious Central European Angst to overlook the delights and joyfulness of Grieg, our northern neighbour! Then the Grand Duo concertant in E major (1838) by Chopin based on themes from Robert le diable by Meyerbeer for four hands, originally written in Paris for piano and cello. His friend the cellist Auguste Franchomme played it and supposedly gave him constructive advice on the cello writing. Hm…The elaborate writing for piano is a real treat and clearly meant by Chopin to please his fashionable Parisian audience rather than make them think. We then had the highly witty and extremely entertaining Variations on a theme by Paganini for 2 pianos (1941) by Lutosławski. Poland is celebrating the 100th anniversary of his birth. I like this work so much. ‘Luto’ has written such accessible yet formally adventurous twentieth century music as opposed to say Boulez or Stockhausen even Penderecki. I had hoped for the Schubert Fantasie in F minor Op. 103 – D.940 (1928) and so it was given to me. What can one possibly say in words about one of the greatest of masterworks in Western musical literature. They took the opening theme at a particularly moderate tempo which I found deeply affecting. In their moving interpretation, silence became as pregnant with meaning and power as the audible notes - as it should be. This great work covers the entire gamut of human emotion and the tragic mystery of death, even anger in the face of the transient joys of life, as no other. To finish up they played the marvellous Libertango by Ástor Piazzola (1921-1992), an Argentinean tango composer who needs little introduction. Whenever I hear his infectious rhythms (particularly with the wonderful instrument of which he was a master, the bandoneon) I have an instant desire to jump on the next flight to Buenos Aires! What a lovely way to spend a summer morning at Polish spa and the children loved it too! August 3 16.00 Lecture 'On the 100th Birthday of Professor Jan Ekier' by Artur Szklener, Ph.D. general manager of the Chopin Instiutute in Warsaw and author. I was only able to follow about 60% of the lecture in Polish but it was an interesting overview of this extraordinary pianist, pedagogue, professor and author. I use his edition of Chopin (a work of obsessional dedication known as 'The National Edition') I am fascinated by the many variant readings he proposes for works. On my 1844 Pleyel playing from the National edition makes a great deal of sense in particular Chopin's sometimes puzzling pedalling indications. Ekier's recording of the Chopin Mazurkas is very fine. Piotr Banasik first played the Chopin Nocturne in F-sharp major Op. 15 No.2 with beautiful bel canto. He then gave muscular, authoritative and individual account of the 4 Chopin Scherzos. Chopin greatly expanded the original musical content of the 'scherzo' (meaning at the time 'jest') to a work of extraordinary power and expressive range. He willfully did this with many genres of the day. Schumann penetratingly observed ' How is gravity to clothe itself if humour wears such dark veils?' The first Scherzo in B minor Op. 20 contains within it the opening phrase of a Polish carol which Banasik understood well, being Polish. The second and third scherzos were written during a period of convalescence Chopin was taking in Marseilles. The powerful expanded drama of these works is packed with unexpected gestures of strange and often bizarre character. The effect of these scherzos on the conventional contemporary audiences can only be guessed at. From the opening notes of Mozart's Rondo in D major K 485 (1786) it was clear we were in the presence of a different class of pianist altogether from many we have heard at Duszniki over the years. I will never forget his appearance here in 2011. Chopin adored the elegance and refinement of Mozart. He then performed the Mozart Sonata in F major K 332 (1783) probably written in Vienna or Salztburg when Mozart introduced his wife Constanza to his father. For me this was a superb performance of extraordinary distinction. His tone, touch and articulation glittered like diamonds in a superbly wrought classical style of great restraint, elegance and refinement of taste (if one can even mention 'good taste' in 2013 without upsetting the mediocre millions with their horrified cries of elitism). He used scarcely any pedal and then only half or quarter pedal. A lesson for many pianists. The audience erupted with tremendous enthusiasm which is the first time in my long concert-going life I have ever seen an audience cheering and applauding wildly after the opening Mozart work in a piano recital. Amazing really. His own surprise and enthusiasm at this response probably accounted for the dynamically over-inflated performance of the Chopin Barcarole Op. 60 which followed. Close readers of my blog will know the opening of this work is rather a bête noir for me as so few pianists seem to know what a barcarole actually was originally, despite Chopin's extraordinary development of the genre. It was a charming gondolier's folk song sung to the swish of oars on the historic Venetian Lagoon or a romantic canal, often concerning the travails of love. Editions of the opening octave of Op.60 vary. For me at least it is imperative to get this dynamic and duration correct as it sets the mood and tonal centre for the entire piece. Some editions give a sforzando marking, others simply forte with a staccato duration. At all events the gondola pushes off relatively gently from the pier, there is no violent incident, the boat rocks in the accustomed romantic barcarole rhythm and the love song begins. If one studies the score carefully the dynamic never rises above fortissimo (and then only briefly during the agitated coda. Piemontesi made far too much of this). Most of the piece oscillates gently between forte, piano and pianissimo with only subtle degrees of heightened emotion throughout. The Barcarole is not the Titanic on the Atlantic! I will never believe this is an explosive virtuoso work and it is almost invariably presented as such. It was often observed that Chopin played with a much lower relative dynamic than were are used to today i.e. forte for him was perhaps mezzo-forte for us or even softer. This together with and as a result of the limitations of the instruments of the day means the dynamic scale of the work is not gigantic. Pianissimo on a Pleyel is the barest perceptible whisper. After the interval he turned to Debussy. From Preludes Book 1 he chose No.2 Voile, No.6 Des pas sur la neige and No.10 La cathedrale engloutie. One could feel and see the water flowing over the cathedral, the vast edifice emerging through the gloom. I found his approach to the composer absolutely ravishing in tone colour, tone, touch and pedalling....he extracted some extraordinary impressionistic sounds from the instrument. He then turned to Book II and No. 8 Ondine and and a quite extraordinary No.12 Feux d'artifice. The spinning Catherine wheels, the exploding star shells and rockets zooming erupted everywhere. Some of the finest Debussy playing I have ever heard since Michelangeli many years ago in the Festival Hall in London - assuming you like the great Italian's approach to playing Debussy. We continued the embedded conceit of the 'water theme' which dominated much of this recital (he evokes the sound of flowing water in an impressionistic sense miraculously on the piano) with Liszt which included two pieces from his Années de pèlerinage. Première anné, Suisse. No. 2 Au Lac de Wallenstadt and No. 4 Au bord d'une source. These were performed with elegant and understated impressionism which only convinced me further that Liszt himself and his piano compositions are in need of rehabilitation of this inspired kind. The stylishness of the Schultz-Evler arrangement of the Strauss Blue Danube Waltz was absolutely to die for - not treated only as a virtuoso warhorse as let us say in a rendition by Josef Lhévinne or Josef Hofmann or Godowsky but a wonderful, elegant work full of charm, style, wit, Gemütlichkeit and panache - as are the Viennese and their delicious cream cakes! This confection simile is not to diminish one iota the brilliance of this reading, a triumph of civilization. The hall erupted into an instant standing ovation and wild jubilation, shouts and applause. We had four encores. The eloquent second movement of Schubert's Sonata in A major D. 664 - reminded me of his deep understanding of this composer two years ago. This was followed by a piece of Mozart I could not recognize and thought it may have been by Baldassare Galuppi, then a deeply affecting, intimate piece of Couperin Le Rossignol en Amour and finally that tempestuous piece of Debussy Ce qu'a vu le vent d'ouest from Book 1 of the Preludes. A truly wonderful evening...a great artist, not simply a pianist, of quite exceptional musicality and imagination. And so we were waiting with great anticipation to hear the 2nd place winner of the 2013 Van Cliburn International Piano Competition and audience award winner. So many I have spoken to here thought 'she should have won' - a refrain I often hear. Remember the audience adoration of Ingolf Wunder at the 2010 International Chopin Competition in Warsaw? Jury decisions remain in the world of the arcane beyond the reach of we ordinary mortals. She opened her recital with a near perfect rendition in pianoforte terms of the Bach Partita No. 1 in B-flat major BMV 825 (1726). It was truly divine and the Sarabande brought many close to tears. Her tone and touch are immaculate and her sparing and inspired use of the pedal accounts for much of the tone she is able to produce. Her sense of baroque style is slightly on the warm, emotional and romantic side for Bach but what of that? A question of personal taste after all. Your dear author is one of those who believe such pieces gain from performance on the harpsichord. But isn't the piano in many way simply a giant clavichord (excepting of course the finger's direct contact with the string via the metal 'tangent' allowing that soulful 'bebung' - vibrato - effect.) Bach is beyond the medium of sound and her performance was musically ravishing and the finest thing we have heard or are possibly likely to hear at this festival. She then embarked upon (and I use the word advisedly) the Schumann Études Symphoniques Op. 13 (1834-1837). In much the same way as Chopin's Etudes they are concert studies with a possible pedagogical element in terms of piano technique and timbre. They are widely regarded as some of the most difficult works in the piano literature. Although Rana gave a wonderful tonally and richly shaded, coloured and technically commanding performance I felt she had not yet come to terms with Schumann's difficult mercurial imaginative temperament. How few pianists can! To be fair I should analyse each Etude she played but I really believe to play these textually difficult 'orchestral' works with a convincing and absolute passion, to capture the electrical whimsy and quicksilver moodiness that flows through Schumann, one needs quite a degree of personal maturity. After the interval, it was the Chopin 24 Preludes Op. 28 for which I would make very similar comments to the above on the Schumann. Fabulous command of the keyboard and the notes but as yet she seemed blissfully (and thankfully) unaware of the 'darker secrets of life' that permeate even infect like a terminal disease these extraordinary fragments. In many ways the present fashionable performance of these works as a set prevents us from considering each extraordinary conception as an individual work. Chopin himself never considered playing them all as a cycle. Each piece contains within it entire worlds and destinies of the human spirit. In both these cases personal maturity and experience is clearly a completely unfair demand of this massive talent and I apologize for my slightly restrained response to all those I know who are desperately in love with her playing. What a brilliant road lies ahead for this wonderful and still so young artist. One reason I love coming to the Duszniki festival is the unexpected. I wait for it and it never fails to arrive. On this occasion rather early in the proceedings and as unique as ever. The glamorous and glitzy world of established international pianism and catwalk model beauty erupted onto the stage in the tiny Polish spa town of Duszniki Zdroj last night. Breathless was I before the music even began. The excellent Russian pianist Olga Kern (we are assured with direct family ties to Tchaikovsky and Rachmaninoff) appeared for the first half of her recital in a fabulous beige and gold couturier gown. I just wish the fashion photographer Mario Testino had been here to do his best work for posterity during the alluring and rather sensual performance - well - at once alluring and distracting for this male member of the audience. She opened her recital with a work I have never before heard the Beethoven 10 Variations in B-flat-major on the duet La Stessa, la stessina from the opera Falstaff by Salieri (1799). As we know Beethoven was temperamentally almost obsessed with the variation form and I really want to listen to this set again after some research as I could not really appreciate it on a first hearing. The pianist requires an almost incandescent imagination to do justice to the genius of this composer. In Carnaval the secrets of the Sphinxes are intelligible and expressed by only the happy few among pianists. Gasps and sharp intakes of breath greeted the appearance of Olga after the interval as she had changed, I felt in a rather New York style, into a different gown for the second half of her recital. It really was a stunning scarlet creation (both front and rear) and together with her undoubted model features and blonde hair tended to preoccupy the audience throughout - even troubled this particular member. Eros rarely emerges onto the Duszniki stage. After the concert the only remarks I overheard were on her appearance and the extraordinary nature of 'that dress'. Very little on her performance. It made me reflect once again on the numerous psychological studies that analyse how the appearance of the pianist, body language, facial gestures and dress affect and contribute to the way the audience listens (or doesn't listen) to the music. I agree this usually applies to unpleasant, eccentric behavior (like the competitor in the 2010 Chopin Competition in Warsaw actually weeping during his performance of a Nocturne). Certainly I felt ardent gestures worked against the brilliant Bulgarian Evgeni Bozhanov in the the same Chopin competition. Francois Couperin in his L'Art de toucher le clavecin suggested placing a mirror on the music desk to cure the performer of unwanted expressions. Rarely however is it sheer sexual allure and style that subverts the musical experience. I am no prude but young artists should consider the effect of their appearance and gestures at the keyboard are likely to have if they wish their musicality to be taken seriously and listened to attentively - the audience is only human after all. Yuya Wang and her recent Rachmaninoff 3 springs to mind! First 3 Rachmaninoff Preludes from Op. 32 (1910). With her particularly deep understanding of the composer Nos. 5, 10 and 12 were finely and idiomatically played particularly No.12 in G sharp minor. I find it ironical in view of her connection with the Russian composer that Rachmaninoff himself was such a shy individual often lacking self-confidence in his undoubted genius. The three Chopin Etudes from Op. 25 however fared less well. No.1 in A flat-major had a superb cantabile singing tone and showed her fine pianism at its best. I would prefer to pass over No.2 in F minor and especially No.10 in B minor without comment. I felt she played the two Liszt Hungarian Rhapsodies with great elan and conviction - her appearance perfectly suiting Liszt's own highly theatrical style. I do not particularly like No.10 in E major (1853) - too bombastic for me - but No.2 in C-sharp minor (1847) performed here with Rachmaninoff 's cadenza was brilliant and for me the most enjoyable work in her entire programme perfectly in keeping with her highly extrovert and warm personality. With a cute gesture of intimacy to the audience she promised only one encore (clearly she is used to audiences begging) but gave three with the same smile and gesture of charming complicity. First of all the Rachmaninoff Prelude in C-sharp minor followed by his Moment Musicale in E minor Op. 16 No.4 and then finally Rachmaninoff's transcription of Moussorgsky's Hopak from his opera Sorochinsky Fair. I am not entirely sure this was actually the piece she played. I had never heard this piece before. And so another fascinating and unusually thought provoking concert at Duszniki Zdroj came to a close. Apropos of the importance of the eye as well as the ear in the judgement of classical music see this slightly alarming article from the UK Daily Telegraph of 20th August 2013 concerning some recent research and my own convictions. I always look forward to Masterclasses with Professor Choong-Mo Kang from South Korea. He is an outstanding pianist and teacher of great integrity and holds many eminent posts on both sides of the Atlantic. The results of his truly humanist approach to teaching has resulted in many of his students being highly placed in competitions with the prestige of the Hamamatsu in Japan, the Queen Elizabeth in Bruxelles, Leeds in England, the Gina Bachauer and many others. It is not difficult to see why as he so beautifully balances praise with constructive criticism that never diminishes the student's view of his own struggling psyche and technique - and what a struggle it is on so many levels to become a fine concert pianist! Intellectual, physical, psychological and the cultivation of the heart. Their self-esteem always remains intact - a rare enough experience. If only he had accepted me as a student and been my teacher - I suffered a great deal in my youth from someone who diminished my self-confidence and I know I would be far more advanced player today. Ah well...c'est la vie to be perfectly clicheéd. I watched him lead the young Pole of great promise Piotr Nowak through the first movement of the Chopin Sonata in B-flat minor op. 35. Here he concentrated on the achieving a rhythm that in the opening of the work that was not bland and repetitive but varied and full of drama. During his illustrations he remarked at one point 'Try it this way, but if you don't like it, play like everyone else does!' He appears concerned that there is at present a strong inherited manner of performance and always encourages the student to think for himself after making his suggestions. He also gave an excellent small talk on what a modern pianist playing on a large cross-strung Steinway can learn from the transparency of the single straight-strung bass on the Pleyels of Chopin's day. I have always advocated the experience for all piano students of playing on an historic instrument as part of their conservatoire training, not to build a career on naturally (there is only one Andreas Staeir) but to penetrate the sound word of the composer and add this knowledge to the regular conventional pedagogical input. With the sensitive musician Ewa Danilewska he spent a great deal of time on refining the actual process of physically producing the sound in their examination of the Chopin Scherzo in E-major. Here he used all sorts of accessible charming imagery to illustrate his points ranging from scoops of ice cream to Tom and Jerry cartoons. He spoke of the importance of breathing and breath control in the physical process of playing, arm weight and finger shape in the production of velocity and the movement of the entire body not in the rhythm of the piece but from 'outside' it building in intensity towards the goal. 'Words are always insufficient for the poetry of this music!' he sighed on more than one occasion. 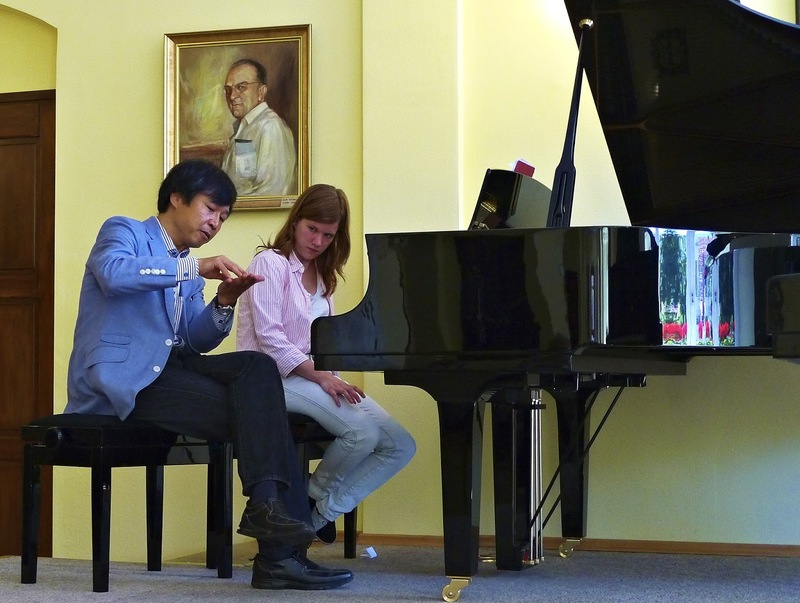 Professor Choong-Mo Kang explaining a fine point of finger technique to Ewa Danilewska at a Duszniki Zdroj Masterclass. One can notice she is watching him very attentively. He is a fine pianist himself and students respond to this Professor as warmly as he does to them. One always approaches young pianists of prodigious talents with a certain caution but I knew instinctively that a pupil of Choong-Mo Kang at the Julliard Pre-College Division in New York would certainly be exceptional. And so it turned out. She opened her recital with the Andante spianato and Grand Polonaise brillante Op. 22 by Chopin. This was a lyrical and superb performance as only a young person with youthful exuberance and full command of the instrument can bring about. The Andante was lyrical and poetic with a wonderful singing bel canto line never allowing us to forget that Chopin loved the operas of Bellini. The great call to the dance floor of the opening phrases of the styl brillant Grand Polonaise rang out and so the scintillating work progressed. Her finger dexterity and control of tone is a miracle (and not just at her young age). One might say 'the diamonds flew from her fingertips' and the great structure never faltered. One of the rarely completely satisfying performances of this work I have heard and I must have heard hundreds! The Chopin Sonata No.2 in B-flat minor Op.35 was extraordinarily mature and profound from this 16 year old prodigy. I kept on being reminded of the maturity of the early recordings of the twelve year-old Yehudi Menhuin. It appears that in life some of us are born 'old souls'. Some of us appear to having been given a surprising even miraculous understanding of life at an early age, at least in musical expression. I really cannot criticize this performance in any meaningful way. The Marche funebre. Lento was laden with grief and the inherent polyphonic nature of the Presto was one the finest I have ever heard from any pianist. She then embarked upon the rarely performed Liszt Hungarian Rhapsody No. 13 Andante sostenuto in A minor with a cadenza by the pianist Arcadi Volodos. This displayed her brilliant piano technique which clearly knows of no difficulties or limitations - it was truly a wonder to behold and hear. This modest young prodigy is transformed at the instrument into a musical wonder and has a great future ahead. He, like many artists today, decided to play the 24 Preludes Op. 28 by Chopin as a complete cycle. Overall it was a particularly satisfying performance because it was clear he had decided himself on certain approaches and each piece had the individual character he had decided to give it. He clearly felt the musical nature of each Prelude deeply and has a commanding technique to realize his inner convictions. As an encore he unexpectedly launched into a Rag by Scott Joplin and did he give it some! The rather staid audience at Duszniki were knocked back by his wonderfully instinctive command of jazz rhythms and ability to communicate his joy at playing the instrument. His smile is enough to light up Carnegie Hall without electricity and I predict a marvellous and brilliant career for this young man, one of the best musical communicators I have encountered in a very long time. Watch out Lang Lang - someone a will be snapping at your heels quite soon (with the right manager)! From the opening notes of the Andante con variazioni in F minor Hob. XVII/6 one certainly felt in the presence of the authentic, bluff 'Papa' Haydn. This was an excellent performance by Gerstein in a robust style which was refreshingly welcome after hearing so many rather emasculated but 'correct in period' accounts. There was substance there with a strong sense of style and the robust 'health' of Haydn well in evidence. In the Olga Kern entry above I have said enough about how Schumann felt about Carnaval. Again I liked Gerstein's straightforward strong approach to the work and, if I may be permitted in these confusing times, muscular masculinity of approach. I could feel Schumann the man alive and indulging his whimsy in the vital character painting. He wound the work up to a very satisfying self-confident conclusion and possibly because of his jazz background had really sorted out the complex, ambiguous rhythmic and dynamic schemes that make Carnaval such a perennially fascinating work. After the interval a tonic in the form of a new piano work of which there are precious few performed at the Duszniki festival. Denis Kozhukhin however always chooses something startling and modern when he performs here. Gerstein had chosen a marvellous work by the eminent and highly respected British composer and conductor Oliver Knussen entitled Ophelia's last dance Op. 32 (2004/2009-2010). Knussen was born in Glasgow in 1952 and was much encouraged in his early career by Benjamin Britten, even living in Snape in Suffolk where the superb Aldeburgh Festival takes place in the Snape Maltings concert hall. I have always liked his music and also that of his wife Sue who so tragically died in 2003. The piece was originally intended for his Third Symphony. Gerstein had given the premiere on 3 May 2010 at the Gilmore International Keyboard Festival in Kalamazoo, Michigan, then a few days later at New York’s Town Hall. The complexity of the work meant Gerstein required a high tech electronic music device placed on the music desk, the score controlled by a foot mouse if there is such a thing! The texture at the outset is light and brilliant which becomes more 'Romantic' and intense as the piece progresses. To conclude this excellent recital Gerstein chose Pictures at an Exhibition (1874) by Mussorgsky. It was a proud performance full of nobility and colour. The rhythm he achieved in the Ballet of the Unhatched Chicks was at once amusing and brilliant, the Hut on Fowl's Legs quite terrifying. However I will remember forever the incredible performance of the work some years ago by Denis Kozhukhin at this festival when one could literally hear the bells and see the Great Gate of Kiev before the mind's eye. This undoubtedly great twenty-six year old virtuoso, born in Kharkov in Ukraine and Winner of the International Franz Liszt Piano Competition in Utrecht in 2008 opened his recital with the Beethoven Sonata 'Pathetique' in C minor Op. 13. This was the composer's first great success in the 'sublime' and was well-known even in his own day. Perhaps because Pisarenko believed the popularity of this work threatened the appreciation of it he decided to 'give it the maximum' in Lisztian terms. He opened with a terrific chord bordering on triple forte where the indication is forte followed by immediate piano.....and so it proceeded as a high virtuoso work of extreme emotion. Look, you are reading here the impressions of someone who is utterly convinced it is vital for a pianist to play and hear these works in a properly absorbed cultural and historical context on period instruments before he transfers to the Steinway or Yamaha concert grand in performance. Particularly considering the unique function of the pedals on earlier instruments. Otherwise all sorts of distortions of the composer's original intentions creep in. Does it matter mon brave? Is a search for the composer's intentions from our historical perspective a wild goose chase? I am not one of your 'authenticist nutters' you know but I think some attempt to contextualize must be made. Yes, I know Beethoven was regarded by many as the greatest pianist of his day but at this stage in his composing career he had not become Liszt or Rachmaninoff. His genius as a composer means he can sustain such dynamically and emotionally inflated interpretative approaches (as can Chopin for that matter) but the idea of Enlightenment sensibility must enter the interpretative picture. The Adagio cantabile was beautifully played but for me the conception of this work as a virtuoso piano display piece of savage underlying emotion however brilliantly brought off did not convince. This was certainly not the case with the challenging 6 Moments Musicaux Op. 16 (1896) by Rachmaninoff. His interpretation was satisfying on every level and brilliantly executed with tremendous virtuoso elan. These rather unknown early works were written in some haste under contemporary financial pressure on the composer. They are dense and chromatic, rich in counterpoint, movingly eloquent of Russian nationalism and highly emotional. They are true concert works and bearing in mind my remarks above, are entirely suited without modification to the great concert grands of our day. After the interval, the Rachmaninoff Variations on a Theme of Corelli dedicated to Fritz Kreisler. The inspiring and moving La Folia theme (set to music by at least 150 composers) is transformed through 20 variations and a Coda into a wonderful work. I felt Pisarenko did justice to this work that Rachmaninoff himself struggled with in performance. Pisarenko produced a magnificent performance of great grandeur and formidable technical command - much Vortex and Whirlwind did we feel. The only thing lacking for me was the complex emotional range Liszt attempted in this work as I have attempted to describe above. A tremendous virtuoso reading but for me it seldom went beyond that in terms of expressing the emotionally terrifying threats and the diabolic intentions of the Inferno. I need the smell of sulphur and danger in this work (as in the B-minor Sonata) but perhaps Pisarenko is far too nice a person to summon up the devil! This very pleasant and civilized evening entertainment on this occasion involved a play between a modern investigative journalist (Anna Skulska) and an actor dressed as Chopin (Marcin Przybylski) answering questions. She in the role of investigative journalist formed the 'tough modern questions' and he answered in 19th century language with appropriate quotations from the Chopin letters. Highly entertaining as this duodrama was interrupted by pieces played by participants in the festival. Highlights of the evening for me were the arrangement for violin and piano of the Chopin Mazurka in A-minor, Op.67 No. 4 (Krzysztof Jakowicz - violin and Andrzej Karalow piano). I do love such arrangements of Chopin - they are redolent of the fin-de-siecle attachment to Chopin and many great violinist composers set Chopin in this way - Sarasate for example. So charming. Pisarenko's Liszt Tarantella was warm like the Italian South (and Duszniki at the moment for that matter!) crammed with virtuosic madness as the poison from the spider bite takes increasing hold. As Sacheverell Sitwell once again appositely comments on the appalling difficulties : '...[it] belongs to that class of Liszt's works which seems calculated to leave the executant paralyzed or struck down with tetanus, at the close of the performance.' However it did not compare with the unparalleled rendition by Alexander Garvrylyuk last year (can be heard again on recording of 67th Festival on DUX 0972 - truly astounding). Mariya Kim gave a tempestuous performance of the B Minor Scherzo Op.31, quite carried away by her own musical involvement in the work. I was very much looking forward to this interesting and imaginative idea of a joint violin and organ recital. The wonderful 'Whale Pulpit' that dominates the church at Duszniki. We began with the Bach Toccata and Fugue in D Minor BMV 565 (1709). A splendid performance on an instrument greatly in need of funding for its restoration. It is a German instrument built in 1939 by Merzdorf. This was followed by the Bach Partita No.3 in E major for solo violin BMV 1006 (1720). A lively and yet very moving performance in what might almost now be considered older style by this great violinist. Brahms 4 Chorale Preludes for organ from Op. 122 (1896) - Nos. 8,9,10,11. I had never heard these pieces before and venture to say that I found them very difficult to respond to emotionally. Unlike the great Bach Chaconne from Partita No.2 in D minor for solo violin BMV 1004 (1720) which he gave in a noble and charged performance of this magisterial piece of western music that towers above so many others involving far larger forces. I found Liszt's Prelude and Fugue on the theme BACH for organ (1885/1870) although magnificently performed on this limited instrument, a rather overblown declamatory work mired in period taste. I really must try and engage with Liszt's organ works despite many such as this one so diametrically opposite to my temperament! To conclude we heard two movements from the Bach Sonata No.1 in B minor for violin and harpsichord (arranged for organ) BMV 1014. This worked extremely well I thought as did the encores one of which was the desperately moving Adagio in G minor by Tomaso Albinoni. In my review of Olga Kern I spoke at length about the effect of the appearance of a pianist on the reaction and appreciation of the audience to his performance. Here we have another outstanding example but in this case substance definitely triumphed over style. 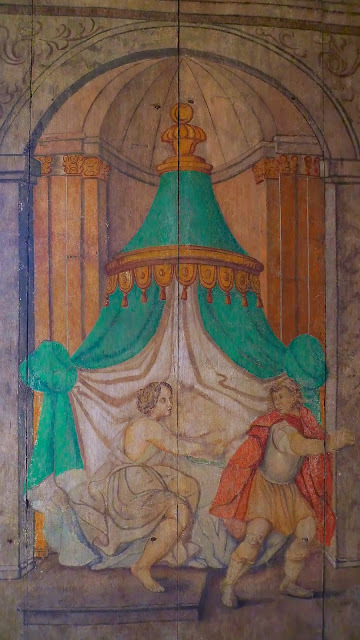 When he appeared on the stage I had the distinct impression that an Italian Renaissance figure from a portrait in the Uffizi Gallery in Firenze had just left the wall and stepped out of the frame. A flamboyant Cellini character with curly brown hair, the trimmed beard of a Medici courtier wearing a coachman style black suit with a spectacular plain torquoise silk foulard and pocket square. What could we expect from this pianist - his credentials were impeccable having won the 2012 Leeds International Piano Competition. The first half was entirely devoted to Mozart. He began with the 6 Variations in F major on Paisiello's aria Salve tu, Domine K 398/416e (1783). From the clarity and glittering tone of the opening phrase I knew this recital would be exceptional. This led into one of the most individual readings of the popular Fantasy in D minor KV 387 (1782) that I have ever heard. His imaginative response to this simple piece (which we all play!) was nothing short of brilliant. Unique and unrepeatable to my mind - an interpretation which will make me think far more deeply when I sit down to play it at the Pleyel. We then moved onto the Rondo in D major KV 485 (1786) and by this time the audience were absolutely silent in admiration - the barest hint of a cough. The first half concluded with the Sonata in G major KV 283 (1774). The dynamic range of his playing, his sure grasp of period classical style (virtuosic and sparse use of the pedal), range of articulation are quite extraordinary. Varied range of colours, timbre, fine tone, impeccable phrasing and a touch that caused sounds to appear as burnished stars resulted in tumultuous applause and many recalls at the interval. How curious as the reception to the Piemontesi Mozart was similarly rapturous but what a different approach this was to the Swiss pianist - both absolutely exceptional. After the interval 4 Impromptus by Schubert Op. 142, D 935 (1827). In many ways Schubert codified the genre of the Impromptu as when he was composing these pieces the nature of the genre was not all clear. Again an exceptional event occurred. There had been a flurry of activity by the operatives with speakers, cables and a microphone just before the beginning of the second half and I was not sure what might be happening. It turned out that 'The artist has requested that a short poem in Polish should be read.' This was duly carried out - perhaps to underline the close connection between music and poetry that Schubert certainly recognized in his immortal songs. It was two lines from the prose poem Gaspard de la nuit by Aloysius Bertrand (1807-1841) which had inspired Ravel. Now looking at Colli I could not help thinking superficially of the wild Italian Gabriele D'Annunzio wandering the gardens of the Vittoriale on Lago de Garda! I have a specific sound world in mind for Schubert one that has analogy with pastel drawings and the search for certainty. For me Schubert is not an oil painter. Much of his solo piano music is that of a deeply introspective figure with desperate rushes of courage and faith in the face of a blighted human existence dominated by the melancholic shadows of death. The blithe Trout Quintet and the strength and determination inherent in say the Wanderer Fantasy are exceptions. Although Colli played the Impromptus superbly well, for me there was too much dynamic contrast and too declamatory a tone and mood for this composer. The ambiguous hints, half-light, struggles with insecurities and flashes of natural joy and struggle with the shades were absent for me in an otherwise very fine performance. The hall erupted with a standing ovation of course and deservedly. As encores he played a virtuosic Bach/Busoni Chorale which I have yet to identify, his own charming and naive arrangement of the Dance of the Sugar Plum Fairy from Tchaikovsky's Nutcracker and a superbly wrought Scarlatti Sonata. He then bowed to the bust of Chopin and turned to the audience announcing 'I am sorry and apologize to all the professors and students and you the audience but that is then end of the classical music. Sorry.' He then launched into the most fantastic virtuoso Boogie-Woogie I have ever heard. What a character! A great evening given to us by a great artist with tremendous personalty, individuality, charisma, pianistic and musical brilliance. Chatting to him afterwards he admitted that his pianistic god is Arturo Benedetti Michelangeli. He assured me he was born in a house in Brescia in the same street and exactly opposite to that in which Michelangeli was born! 'We Dandies must stick together!' he said referring to my own not entirely restrained attire (Turnbull and Asser blue and yellow striped silk bow tie, Jermyn Street navy linen reefer jacket etc etc which I adopt here as a low profile statement of my superficial nature). Wonderful to meet someone so alive ... and unlike Olga the talk afterwards was only of his playing! I remember hearing this South Korean pianist at the 15th International Chopin Competition in 2005 when he was awarded joint 3rd place with his brother - a quite unique achievement. I was interested to hear any development (or decline) that had taken place in the intervening 8 years. I need not have worried as he began with four superbly played Chopin Nocturnes (B-flat minor Op. 9 No.1; E-flat major Op. 9 No.2; C minor Op. 48 No.1 and E flat major Op. 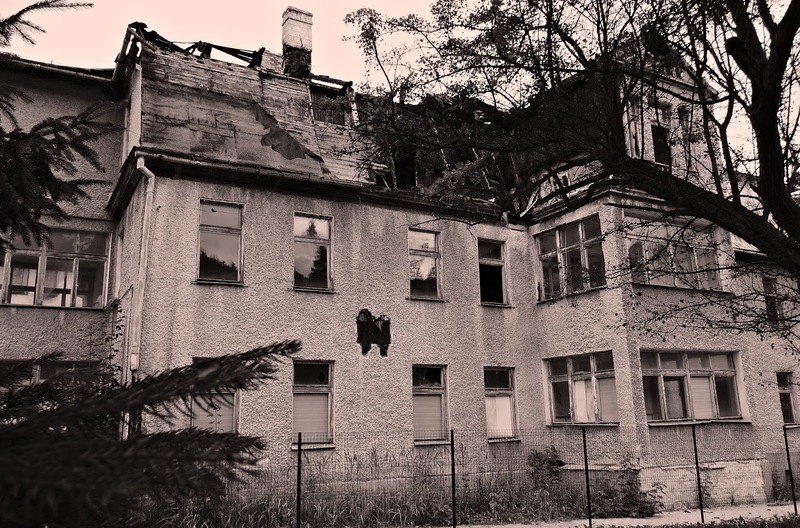 55 No.2). Everything was correct and luminous here - touch, tone, wonderful bel canto cantabile vocal lines, restrained execution uncluttered by mawkish sentimentality. The Chopin B-flat minor Sonata Op. 35 (1837-39) was very fine from the pianistic point of view and execution but once again I felt he had not a great deal to say of a mature individual character as we had so recently experienced the night before. This is a haunting work of complex rhythms and the ominous threat. The state of immanence that lies over it must become evident by the time we reach the Marche funebre and then the disturbing Presto. I must now confess to something quite awful. I could not face hearing yet another performance of Mussorgsky's Pictures at an Exhibition which Lim performed after the interval. Of course it is one of the greatest descriptive pieces of pictorial Western piano music in existence but in one way this is its limitation - no metaphysical depths to constantly plumb and explore through new interpretative discoveries. It is immensely popular with young artists for good reason and I have heard it endless times. Please forgive me if this sounds small-minded but by the Thursday at Duszniki one is becoming aurally quite tired. As I ambled out of the Spa Park I could hear the work resounding over the loudspeakers and it sounded a splendid account. Naturally I was anxious to hear this 1st prize Winner of the 2012 Hamamatsu Competition. he opened his recital with the Chopin Trios nouvelles Etudes Op. posth. (1839). Perhaps because Ilya's studies were mainly outside Russia (Hanover and Paris) he seems to me quite atypical of the 'Russian School' of overtly muscular and huge-toned pianism - a tender Russian of the Chekov School one might say. The Chopin for me was absolutely perfect in taste, tone, touch, phrasing and possessed of that eloquent yet elusive climat de Chopin referred to by Princess Marcelina Czartoryska, the friend and pupil of Chopin. I love these rarely performed works which for me encapsulate the finest in nineteenth century sensibility, charm, civilization and salon refinement. He followed this with the Schubert Sonata in C minor D 958 (1828) written shortly before the composer's death. There is a unified tonal design in Schubert's last three sonatas and many connections between them. They are sometimes performed as a cycle. The opening Allegro was brought off well with its Beethovenian reflections and highly chromatic development section. The Adagio was of course finely performed pianistically but for me the haunted nature of it, the dreamy qualities, the anguished szforzandos, the emotional content was largely absent. Similarly I was confused by the too straightforward approach to the Menuetto: Allegro and Trio containing passages which are so mysteriously interrupted by that ghostly, eloquent silence which should make your heart fearful of the abyss that lies ahead of us all. In expressing successfully the feeling of human alienation I cannot remove Alfred Brendel from my inner ear here and even more Grigory Sokolov. The closing Allegro of self assertiveness was therefore not as meaningful as it might have been. Unfair as this comparison is to Rashkovskiy, the Sviatoslav Richter reading of this work reveals much of the inner emotional life of the sonata. After the interval the Rachmaninoff Etudes-Tableux Op. 39 (1916-1917). Although some of the professors I chatted to found his approach lacking in 'having something to say' I beg to differ (as an amateur) and really loved this performance. Rashkovskiy presented the composer in a way which was dynamically far more reasonable, possessed of a lyricism of high degree of refinement, even elegance and carrying a moving nationalist fervour. The performance was not simply an assault upon my person which I am subjected to by so many Rachmaninoff performances. Rashkovskiy, the 'gentle Russian' from Irkutsk, the Chekov of the piano, was very seductive tonally and blissfully used the pedal far more discreetly than most who approach these works. Considering his heavy teaching load, jury participation and other activities I thought it quite courageous of this Professor of Musical Arts at the Academy of Music in Katowice to give a solo recital in the severely critical climate of the Duszniki Festival. Despite his wide experience and repertoire he must have had limited practice time in comparison with any of the young full time concert artists. The first half of his recital was devoted to the 4 Ballades of Chopin. In Chopin's day the word 'ballade' evoked all manner of literary and musical associations. However as was often the case with the composer, even this first Ballade is a development of the popular form which was to become a genre all Chopin's own by the completion of the fourth. The G minor probably remains the most 'popular' still and as the great Chopin musicologist Jim Sampson comments 'More than any earlier work by Chopin, the G Minor Ballade is a triumph of architecture...' Raubo clearly understood this type of thing and gave an excellent account of it. I did feel his robust and rather 'strong' approach was not always appropriate and the high degree of refinement of articulation and touch one becomes accustomed to in Duszniki was not always present. However very satisfying in its way by a pianist clearly of great integrity and not out to impress through egotistical display, unlike many here! The second Ballade (arguably following non-programmatically a poem by Mickiewicz - a perennial conundrum) was well brought off as was the third. He was clearly always involved with the music and gave a great deal of himself to the performance. Of the four I found the great Ballade No.4 in F Minor the most moving. The simplicity of the opening was poetically wrought with fine tone and touch and the erection of its complex architecture cohesive and a complete whole - not an easy task. As encores Raubo played Mozart and a quite superb, poetic and heartfelt account of the Nocturne in D-flat major Op. 27 No.2 - limpid tone, touch and delicacy - by far the best thing in the recital! As mentioned above how often the encores of fine pianists are superior to the rest of an 'official' programme....a psychological explanation? Naturally one has the highest expectations of the Russian winner of the 2013 Queen Elizabeth Competition in Bruxelles. However I found myself rethinking many of the pieces on this programme rather against my will or perhaps rather against my 'received interpretations' built up over many years. Certainly his sheer individuality on many levels of pianism and musical interpretation was quite striking. He opened his recital ambitiously with all 4 Ballades of Chopin. I wish to digress slightly before dealing with this fine artist. The modern programming of complete cycles of large Chopin works (ballades, scherzos, preludes, sonatas, etudes) although impressive musically I find very demanding on both listener and performer. The practice is entirely out of step with the programming practice and aesthetics of Chopin's own day. Of course in 2013 it does the reputation of the pianist a power of good among his professors and agents, those devotedly assisting the building of his career in the fiercely competitive present piano landscape. However I feel it tries the stamina and more importantly, the concentration of everyone even of the cognoscenti. A form of overeating the richest of foods musically speaking. So seldom at Duszniki (or anywhere else for that matter) do we hear any of the many less performed Chopin waltzes, mazurkas, rondos, early polonaises, less well known nocturnes and delightful ecossaises - much of it wonderful, supremely melodic music. Chopin never contemplated the idea of cycles of his works when he gave a recital. Variety was tantamount. Clearly performers and those designing these programmes today find his example (and much else in his performance practice) of no contemporary historical relevance whatever but why I ask myself? It would give a charming, welcome (dare I mention the word 'entertaining') respite from the all pervading 'high seriousness' of the career-building aesthetic deemed absolutely necessary these days and which dominates so much piano recital programming in 2013. Giltburg's view of the Ballades was to approach each of these four masterpieces as more of a highly individualistic poetic and lyrical statement of loosely connected episodes than a dramatic and tightly cohesive musical narrative to which we have become accustomed over time. His superb tone and articulation produced episodes of exquisite beauty - the limpid and innocent opening pages of the F minor Op. 52 for example. However I felt he presented these works with a degree of rhythmical discontinuity and constantly interrupted forward momentum (in order to concentrate on a beautiful sequence, melody or resolution) that I found most disconcerting - the G minor Op. 23 is a case in point. I am accustomed to hearing these works presented as musical 'stories' with musical episodes that link together more organically, move towards a climacteric without excessive hiatus in tempo and rubato, harmonic episodes and transitions that lead seamlessly into one another to form an integrated contiguous dramatic whole conceptually speaking. Is this a criticism? Well, yes and no. 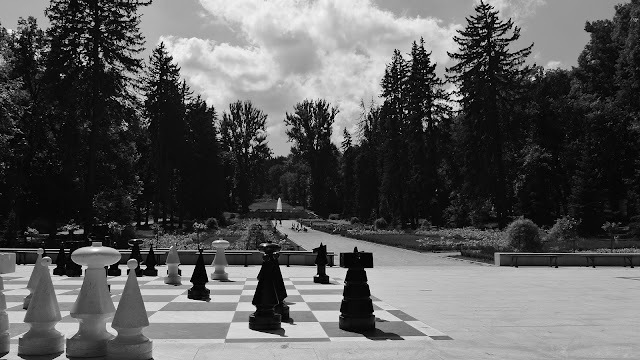 Of course at this, what one might say, ultimate level of pianism, any criticism is determined by the taste and musical education of the critical listener, a question of how one personally conceives of the meaning of a Chopin Ballade. A fraught subject indeed once one considers the historical meaning of the Ballade and the process in which Chopin made it his own. There is no such thing as 'correct' and 'incorrect' at this level. I have not the time or space, and you the attention or even interest, to listen to my detailed analysis of each work so suffice these general remarks. Yes, a very different approach to Chopin than contemporary Poles might wish by Giltburg. After the interval he turned to 3 Etudes Tableaux by Rachmaninoff - No. 1 in C minor, No. 2 in A minor and No. 6 in A Minor. These were certainly more satisfactory for me than the Ballades but nevertheless I kept feeling the interruption of forward momentum to the climaxes in these pieces. Fine interpretations indeed but I kept asking myself what is Giltburg saying about these works and never came up with a proper answer. His gnomic posture at the instrument can be rather alarming as he crouches so close over the keyboard in staccato passages but I think we have said quite enough above concerning the appearance of a pianist at the instrument and its effect on the audience. However his is another case in point. Finally the Prokofiev 'War Sonata' Sonata No. 8 in B-flat major (1939-1944). Let me just say I found this a powerful, deeply intuitive reading that revealed the emotional and certainly in this sonata, the more lyrical side of Prokofiev. Here the particular physiology of Giltburg's individual and characteristic sense of rhythm, phrase length and tempo were an undoubted strength. His formidable finger dexterity and bravura playing lifted this work to another plane. For me a brilliant account of the mercurial, possessed, politically subversive psyche of the composer. The individuality of Giltburg and his approach to the instrument has given me a few sleepless nights full of perplexities and questions of interpretation. What more can one ask of a pianist? Professor Vardi is one of the most eminent of pianists, recording artists, piano pedagogues and international piano competition jury members working today. More than 30 of his students have won first prizes in major international competitions including Boris Giltburg. It was clear from his first Masterclass that his authority was profound and his depth of experience of Western keyboard music detailed and formidable. He included the audience far more in his tuition than many professors who have worked with students at Duszniki. His love of the music of Chopin and detailed knowledge of it was clear from his work with Piotr Banasik (who I remember gave a brilliant account of Chopin's Bolero in the 2010 International Chopin Piano Competition in Warsaw). With Piotr he spoke much of breathing and spent time conducting the pianist at the instrument, an activity rarely done but that brings great and immediate benefits. He seemed able to play musical illustrations or any small, similar or instructive passage from any work in the entire Western piano literature! Quite amazing! I then experienced one of the most remarkable moments of any Masterclass I have attended anywhere. Andrzej Karalow had courageously and imaginatively chosen for study the Liszt transcription of Wagner's Overture to Tannhäuser. He gave a tremendous performance and we all shouted 'Bravo!' at his audacity in choosing such a work for a Masterclass. Incidentally this was the first great orchestral work I ever heard as a child and it shattered me emotionally. As a preamble and with the greatest dignity and passion Professor Vardi told us he felt that as he was in Poland and working on this Overture he was 'compelled' to touch on the fraught subject of the performance of the music of the anti-Semitic Wagner in Israel and would conclude this 'story' with a profound irony. He spoke of Wagner's 'poisonous' anti-Semitic writings, the Nazis love of his music and how many Jews today in Israel are permanently and incontrovertibly against performance of any of his music there because of this racism and history. Daniel Barenboim has faced the same issue but both see no connection between the immortal musical works that Wagner produced and his warped racial theories. Now to the irony. Vardi spoke of Theodor Herzl, the founder of modern Zionism and effectively the founder of the State of Israel. He told us Herzl was an avid listener to Wagner's music and even looked to it for emotional support during the move to found the State of Israel and the attempt to give pride back to the Jewish people. In the early summer of 1895 Herzl relaxed at the Paris Opera by listening to Wagner's Tannhäuser. At the opening of the Second Zionist Congress in 1895 Herzel arranged that the Overture and other music from the the opera to be played. The irony of this was not lost on us - Herzel the Zionist overlooking the 'tainted greatness' of Wagner in light of the greatness of the music. A lesson surely for us all in tolerance and abhorrence of racial bigotry. I found the humanism and elevating cosmopolitan worldliness of this issue being brought into a music Masterclass in a tiny spa town in Poland profoundly uplifting. As any reader of my writings will know I am a staunch advocate of giving students a contextualized and imaginative 'wider picture' of the possible cultural contexts and interdisciplinary approaches to musical studies. Although Vardi was motivated by the tensions lying within his own soul I felt it extraordinary that before analyzing the Liszt transcription in detail he had asked Andrej Karalow to broaden his frame of reference and reflect on such a noble theme before playing. Later he spoke of Romantic music tending to excess, 'imbibing' Wagner being similar to the dangers of alcohol and imitating at the keyboard the orchestral timbres Liszt preserves so well. We then turned in diametrical contrast (and in some aural relief) to Mozart and his Concerto in D minor with Ewa Danilewska. He was surprised and highly impressed by her knowledge (and other Polish students) when he asked her 'Do you know any other Mozart works in D minor?' and she rattled off sections of the Requiem, Don Giovanni and of course the Fantasy in D Minor for piano. He was full of effortless musical analogies offering many varieties and variant possibilities of articulation dynamics and phrasing with effortless musical logic. 'Mozart never tends to excess' he pointed out. He also spoke of the most beautiful and magical moments in Mozart being his transitions from the major to the minor keys in his his works. I left this Masterclass floating on air - uplifted by the deepest of musical knowledge and humanism of a very high order indeed. Oh....and for those cynics among my readers....I am Anglo-Australian and have no Jewish or Polish roots. The reason I live in Warsaw is that I simply fell in love with the landscape and one particular Polish lady, quite apart from my love for the music of Fyderyk Chopin. The perfect cat - but I think too sweet to be a Kater Murr - a 'Growler' - seated in a window of a dilapidated house in Lądek Zrdoj near Duszniki Zdrój, Lower Silesia, Poland. Mariya Kim began her recital with one of Schumann’s greatest piano works, Kriesleriana. Madness or insanity was a notion that throughout the composer's time on earth simultaneously attracted and repelled Schumann. At the end of his life he was cruelly to fall victim to it. Kriesleriana was presented publicly as eight sketches of the fictional character Kapellmeister Kreisler, a rather crazy conductor-composer who was a literary figure created by the marvellous German Romantic writer E.T.A. Hoffman. 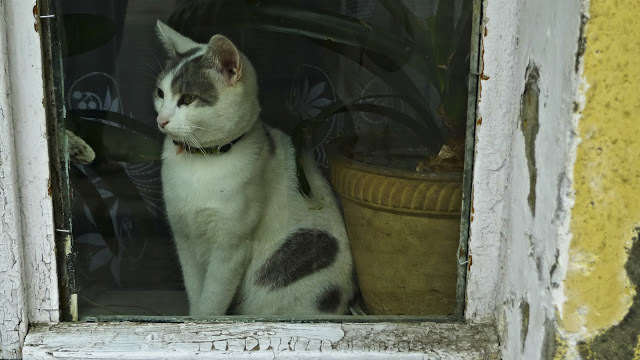 The piece is actually based on the form of an inventive grotesque satirical novel Hoffmann wrote with the remarkable title Growler the Cat’s Philosophy of Life Together with Fragments of the Biography of Kapellmeister Johannes Kreisler from Random Sheets of the Printer’s Waste. It is a very difficult work to present as a coherent structure and Kim succeeded in making the thorny transitions from wildness to lyrical love dream with skill and moving poetry. The extreme shifting of moods in this Schumann piece were captured through tempo and dynamics although I found the polyphony rather blurred due to the pedal and some tempi too rushed for my view of the work. It is fiendishly difficult to bring this work off successfully - Horowitz, Richter and Kempff are my benchmarks. Schumann advised Clara not to play the work too often as the passions aroused and nostalgia would be too strong to bear. After the interval three settings by Liszt of Polish songs of Chopin. Six Chants polonaise de Chopin S. 480 No. 1 Zycenie (A Maiden's Wish) No. 5 Moja pieszczotka (My Darling) and No. 4 Hulanka (Drinking Song). These are charming transcriptions of the op. 74 songs beautifully played and I just wished she had played the entire set. This was followed by the Chopin Andante spianato et Grand Polonaise Brillante in E-flat major Op.22. Clearly Kim has a lyrical gift and the polonaise revealed a brilliant pianist with powerful fingers. Curious small slips on occasion (as with so many led into cruel traps by Chopin in this deceptive work). She closed her concert with Rachmaninoff's Variations on a Theme of Corelli Op. 42 (1931) dedicated to Fritz Kreisler. The inspiring and moving La Folia theme (set to music by at least 150 composers) is transformed through 20 variations and a Coda into a wonderful work. I felt Kim played this work outstandingly well and did not swamp the Baroque character and texture with the pedal. The darker more intense emotional side was handled intuitively by this fine Ukrainian pianist. However this performance was not quite personally dramatic enough for me. A stunning version by Andre Watts springs to mind in this regard. Rachmaninoff himself was curiously lacking in self-confidence concerning this work and struggled with it in performance. It was the only original work he composed during his exile from Russia, the motherland he left in 1917. The audience 'dress up' for the final recital of the festival in a way I find charmingly anachronistic and very East-Central European. There is something socially very satisfying in preparing to attend a much anticipated recital and the winner of the First Prize in the 2013 Van Cliburn Competition is a case in point. He opened after a bemused bow to us (rather like a rabbit in the headlights) with the rarely performed Sonata No.1 in D minor op.28 (1907) by Rachmaninoff. I had never heard it in live concert before and it is seldom recorded. His Sonata No.2 Op. 36 is far better known through Horowitz et al. This was a most brilliant, incandescent performance the like of which I felt privileged to hear - quite magnificent on every level of pianism and interpretation. Rachmaninoff composed the work in Dresden where he was living a quiet life with his wife and daughter. He was initially inspired by Goethe's Faust and although reducing the influence of the play in the composition he did not escape his initial inspiration altogether. The Allegro moderato first movement was fabulously played by Kholodenko and expressed the turmoil of Faust's mind with a burning emotional intensity and brilliantly under-pedalled articulation. I do not think it fanciful to associate the second Lento movement with its long flowing melodic lines with Gretchen. Here Kholodenko's singing cantabile was too beautiful for words. Could the tempestuous and agitated Allegro molto third movement which ends with such an incredible climactic rush of huge wild chords not be Mephistopheles? His double forte tone never broke through the ceiling of the instrument and was always rich and never uncomfortable unlike many pianists who play in this small hall. One of the few pianists who tailored his tone to the size of the Dworek Chopina (capacity around 350). A great work and a great performance of it. After the interval - Chopin. First of all 2 Nocturnes Op. 62 (1846) B major and E major. These were superbly and most movingly played, reducing some of the usually more resilient members of the audience to tears. Then 2 Polonaises Op. 26 (1835) No.1 in C sharp minor and No.2 in E flat minor. He produced a finely controlled polonaise rhythm and dynamic, under-pedalled and of great finesse - ideal performances to my mind as were the three polonaises that then followed. The so-called 'Military' A major Op. 40 (one of the very best performances of this I have ever heard - brilliant rhythmic attack and sparkle of an incontrovertible masculine 'military' character), the C minor Op. 40 and finally the A-flat major op.53 which brought the cheering and applauding audience to their feet. It began moderately which he gradually worked up to a final triumphant statement of the main theme - an impressive manipulation of our emotions. Encores included the Bach/Siloti Prelude in B minor and various impressive Medtner works I will eventually identify and a final encore that aroused great discussion among the professorial cognoscenti and the national broadcaster. A moderate, sensitive Ukrainian pianist of vibrant imagination and complete command of the keyboard, not an insensitive muscular thunderer, a man who plays Chopin in a truly intuitive Polish style and Rachmaninoff like a master. This young twenty-seven year old pianist of stupendous talent has a tremendous future ahead. During the festival I decided to explore the Felix Mendelssohn connection with Duszniki Zdroj. I am always disappointed there is not at least some Mendelssohn played at each festival although we have heard works by him here in the past. 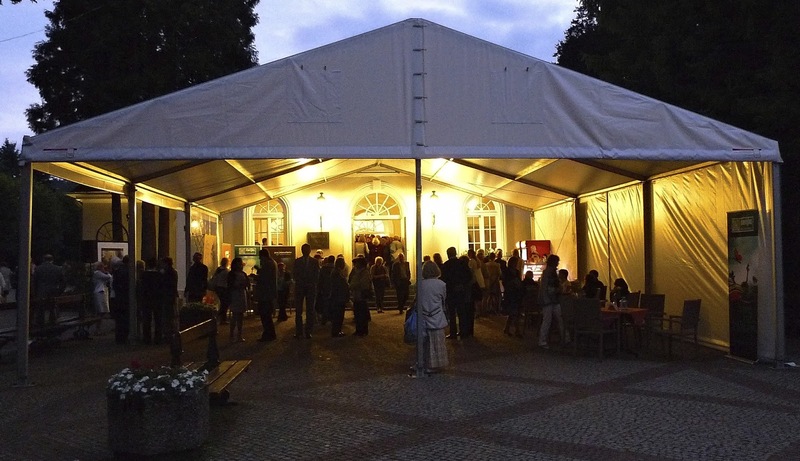 The Mendelssohn Festival was resuscitated in Duszniki 2011 (one was regularly held in Duszniki before WW II I believe) but as is often the case in Poland publicity of the event in November and December 2012 was limited. Is there to be one in 2013 ? Let's hope there will be more of his delightful piano music next year in 'our' piano festival! 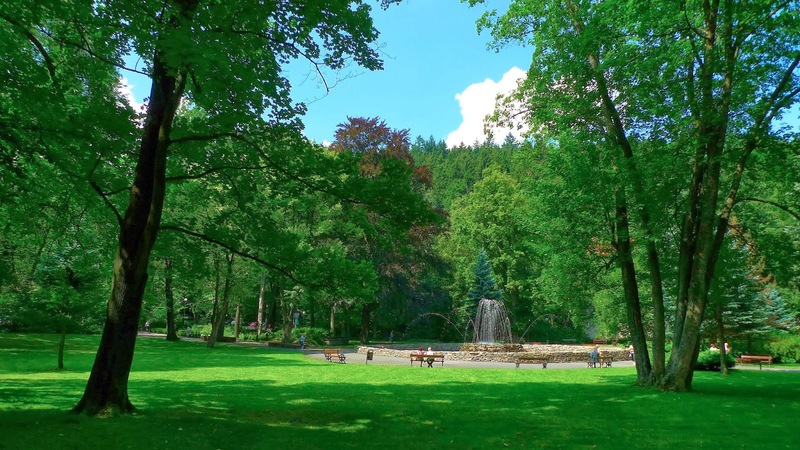 The iron ore deposits of what was Bad Reinerz (now Duszniki Zdroj) and its surroundings have been known since the beginning of the 15th century. Protestant miners emigrated here during the religious turmoil of the Thirty Years War when mining was established at the end of the 17th century. A molten iron and a hammer mill was established in 1822 by Nathan Mendelssohn (an instrument maker). With his brother Joseph Mendelssohn's financial help he revived the mining industry. Joseph was a successful banker as well as being another uncle of the composer Felix Mendelssohn. The Mendelssohns were a wealthy and well-established family. However the iron company had no lasting success because of severe flood damage in 1827 and 1829. 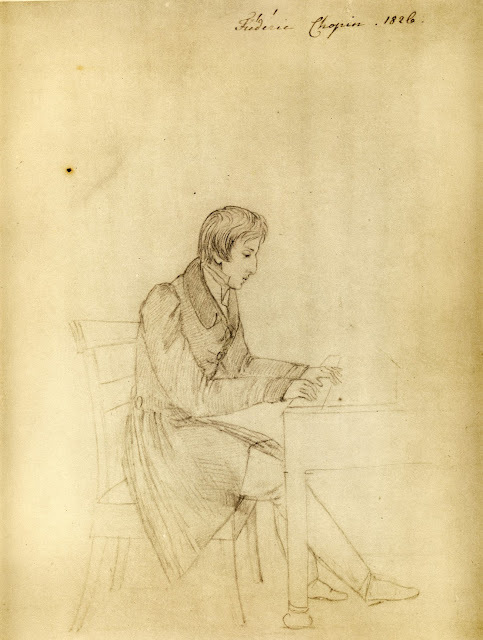 Nathan Mendelssohn abandoned the operation at the end of 1829. 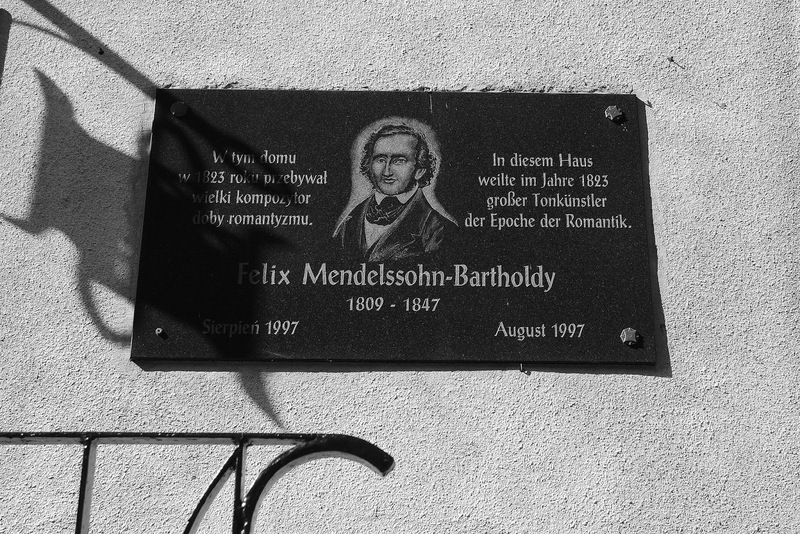 Felix Mendelssohn came to stay with his uncles in Duszniki in 1823 three years prior to Chopin's stay. 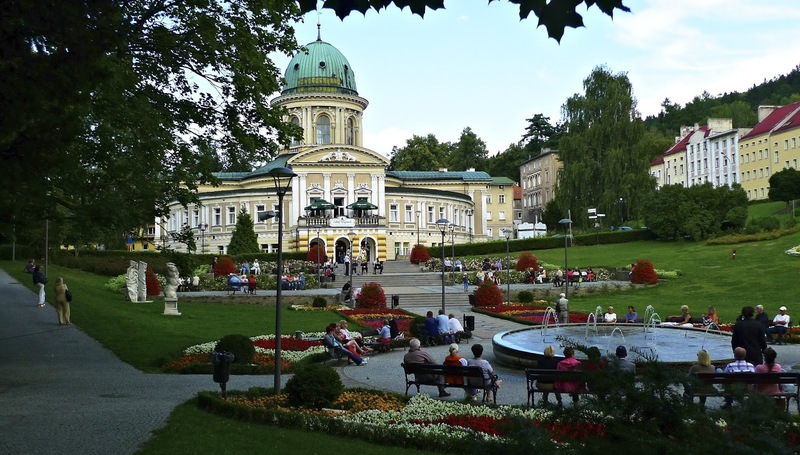 A concert was held in Duszniki in which the main protagonist was the fourteen-year-old Mendelssohn. The young pianist did without the accompaniment of the semi-amateur ensemble that normally performed and decided to improvise solo on themes from Mozart and Weber. I will leave you with some photographs that resulted from my explorations. I visited this historic spa which is about 45 kms from Duszniki a couple of years ago and was much taken by the magnificent Wojciech Zdroj. At that time they were landscaping the gardens in front of the thermal rooms and I wanted to see how they had turned out. I also wanted to enjoy their fantastic iced coffee on the terrace! A band (3 violins, electric piano, piano accordion) was playing some delightful tunes such as the Adagio from Mozart's Piano Concerto No. 21 (the 'Elvira Madigan' film theme), rumbustious Hungarian dances, the Theme from the movie 'Love Story', Strauss waltzes and so on. Photographs below (click on for enlargement - much better! ).